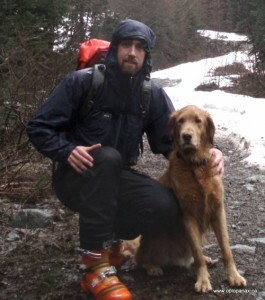 Home › Blog Entry › Why does SAR Search for Dogs? There’s a relatively high profile search for a dog under way on Mount Seymour at the moment, and an accompanying amount of local, national and international media coverage. From looking at the comments on some of these web sites, and watching the news, it looks to me that some people don’t understand why Search and Rescue teams are looking for a dog. I think some people consider this a waste of resources. First let me be clear that I am not involved in this search, and have no knowledge of the particulars other than reading, watching and listening to the news. I haven’t even turned on my SAR radio to listen to the ongoing search… it’s really not my business. However, as a SAR member, and manager, it is my business to know Emergency Management BC’s policies on this, and they seem clear to me. Domestic animal rescue for humane or public safety reasons are also the responsibility of the Police. The Police may request SAR volunteer resources through the PEP Emergency Coordination Centre for the following eligible activities. Domestic animal rescue is considered a public safety issue. The police of the local jurisdiction have the discretion to decide when an animal’s rescue is humane and in the interest of public safety. At that point they can request assistance from the Provincial Emergency Program (now EMBC), and activate SAR volunteers to assist. If you think about this, you can see that it’s in the tradition of first responders to save animals, as everyone knows from the apocryphal stories of fire-fighters rescuing cats from trees. In a more serious light, the findings of the Hurricane Katrina Commission in the United States resulted in the passing of the Pet Evacuation Act which requires states requesting aid from FEMA to accommodate pets and service animals in evacuation plans. The reason for this legislation is that people actually dies because they were caring for their pets. What are the reasons why a lost animal might be a public safety issue? In this case it seems that the dog has gone missing in a clearly dangerous area of Mount Seymour where many people have been lost, injured and even died before. What’s more, it’s winter and hence more hazardous. Finally, the dog’s owners have asked for the public’s assistance via Social Media to find the dog, attracting many people to the area. This is a clear public safety issue, as those well-meaning people may not understand the hazard, or be prepared for the conditions in the area. Luckily it seems that recent Social Media posts have been asking for members of the public to leave the area and let SAR members do their jobs.